relation to personal accounts of suffering? Can these narratives be judged on aesthetic grounds? Are they a collective expression of the lost intimacy of the patient-doctor relationship? Is their function thus instrumental—to elicit the reader’s empathy? To answer these questions, Ann Jurecic turns to major works on pain and suffering by Susan Sontag, Elaine Scarry, and Eve Sedgwick and reads these alongside illness narratives by Jean-Dominique Bauby, Reynolds Price, and Anne Fadiman, among others. In the process, she defines the subgenres of risk and pain narratives and explores a range of critical responses guided, alternately, by narrative empathy, the hermeneutics of suspicion, and the practice of reparative reading. 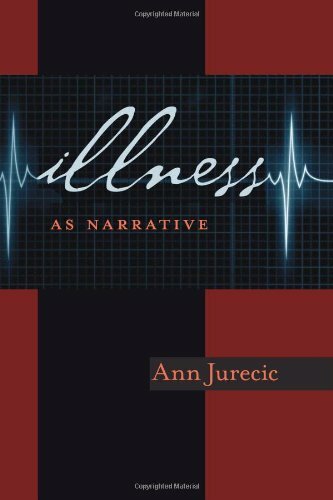 Illness as Narrativeseeks to draw wider attention to this form of life writing and to argue for new approaches to both literary criticism and teaching narrative. Jurecic calls for a practice that’s both compassionate and critical. She asks that we consider why writers compose stories of illness, how readers receive them, and how both use these narratives to make meaning of human fragility and mortality.